1. it's easy/cool enough to accomplish in the short amount of time I have between painting/cleaning/moving/eating/sleeping/taking care of the family when I can and ohh yeah, working. 2. relevant to my hobbies. 4. I hope to put a smile on someone's face and save some of that hard earned coin, who doesn't like that? For this first project you will follow me on a journey to build a FPV quadcopter. Let's start with a little explanation. FPV stands for First Person View. Basically you fly your aircraft remotely using a camera mounted to the airframe, seeing what an actual pilot would see. Pretty cool ehhh! 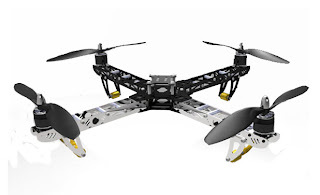 A quadcopter is an airframe (like a helicopter) that uses 4 rotors for movement in either an "X" or "+" configuration. For this exercise we will be in the X config because we will be mounting cameras. This will be a learning exercise for both of us as the video and maybe even telemetry (checkbook allowing) transmit "Tx"/receive "Rx" is new to me. Basic rundown of BillOfMaterials is as follows. This build will be broken into 2 parts. The first will be the build and trimming of a basic quadcopter ensuring proper flight characteristics and working out any bugs. I'll also tweak the design to afford a comfortable load carrying margin for the added weight of the FPV equipment. The second part will be the install of the FPV gear, debugging and finally some flight footage (yeahhhhh). I'm excited because FPV is uber geeky cool. I feel like capturing some incriminating footage of someone ;) Also, this will be used to video the in-law's house in Guimaras, which was the initial intent of the failed flying footage posted earlier. Round 2 I hope will be better. Next week I'll detail the build list and cost and hopefully have some parts on order. Most of the electronics will be coming from HobbyKing's international warehouse so 2 weeks transit is the norm.